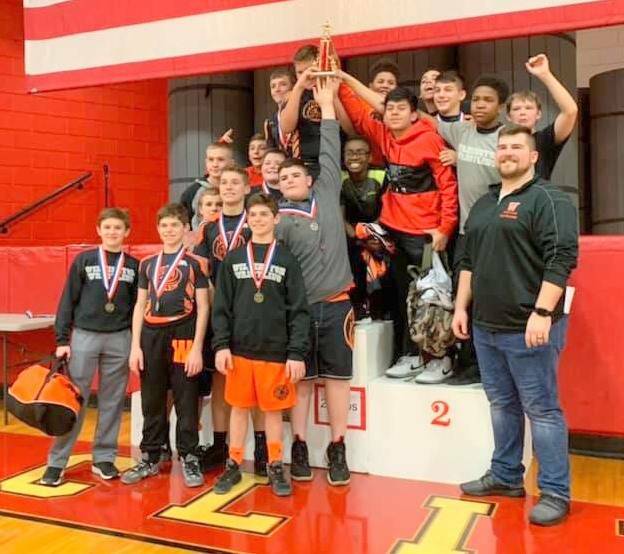 LEES CREEK – Wilmington’s Rodger O. Borror Middle School wrestling team finished a close second Saturday at the SBAAC Middle School Wrestling Championship at East Clinton High School. Blanchester finished fifth overall, the highest of any of the National Division schools while East Clinton was sixth and Clinton-Massie eighth. Clinton County had nine weight class champions in the event. For the Rodger O. Borror squad, Thane McCoy at 92, Devon Snyder at 98, Carson Hibbs at 104 and Alexander Smith at 172 were champions. Champions for Blanchester were Carson Curless at 122 and Cody Kidd at 160. For East Clinton, Ethan Kessler at 205 and Jacob Cubbage at 245 were first-place finishers. The top wrestler for Clinton-Massie was Gatlin Newkirk who won the 80-pound title.